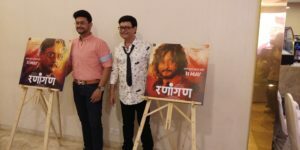 Upcoming multi starrer Marathi drama movie Ranangan is the reason to create the heat in this hot summer but yet interesting. It’s soon to be released on 11th May 2018. 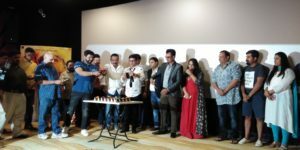 The movie has a huge popular star cast like Sachin Pilgaonkar, Swwapnil Joshi, Siddharth Chandekar, debutant Pranali Ghogare, Suchitra Bandekar, Aanand Ingale, etc. 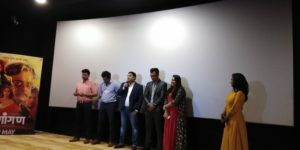 Recently the trailer launch event for the movie was held at Andheri in the presence of the star cast and team members of the movie. Let’s have a look at the event and see what these celebs have for us in the Selfie Video above. In the trailer launch there is a surprise revelation of Sanjay Narvekar and Mukta Barve’s appearance in the movie. Now what are their characters, what is the plot everything is increasing so much excitement. Along with the story and strong star cast movie’s major strength is its music. The songs for the movie are penned by the uncrowned king of words Guru Thakur and Sameer Samant. Music is done by multi talented music directors Rahul Ranade, Avadhoot Gupte, Sachin Pilgaonkar and Shashank Powar. 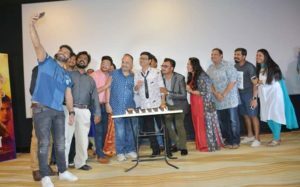 Songs are sung by Avadhoot Gupte, Vaishali Maade, Swapnil Bandodkar and Aanandi Joshi. Songs like Naad Karaycha Naay and Vinayaka Gajanana are already chartbusters. 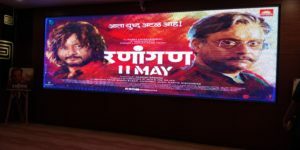 The film is directed by popular director Rakesh Sarang. It’s produced by Karishma Jain and Jo Rajan and co-produced by Kartik Nishandar, Arjun Singh Baran. Ranangan has many unique aspects which are making it more interesting. Like the whole star cast looks to be in a complete new look and complete different characters than they have played till now. 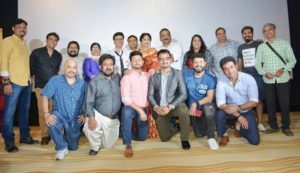 Swwapnil Joshi and Mukta Barve are once again back together on silver screen. This movie is full of surprises, twists and turns and a complete entertainer. Ranangan is presented by 52 Weeks and GSEAMS. In the launch event whole Ranangan team have shared their experience and celebrated the launch by cutting the cake. Marathi Actor, Marathi Celebs, Marathi Actors, Marathi Celebrities, Marathi Actors Wallpapers, HD Wallpaper, Marathi Entertainment Industry, M town, Celebrities, Directors, Producers, Marathi Directors, Marathi Producers, Lyricist, Screenwriter, Cast and Crew, Cast & Crew, Marathi Movies, Films, Songs, Marathi Serials, Teasers, Trailors, Trailers, Selfie Video, video profiles, Celebs Katta, MarathiCelebs.Com, Marathi Website, Film Reviews, Articles, Videos, Marathi Actresses, Marathi Actors Biography, Marathi Actresses Images, Pics, Upcoming films, Upcoming Serials, TV Updates, Film Industry, Photos, Promotions, Interviews, New Films, Selfie Interview, News, Trailers, Zee marathi, zee yuva, star pravah, zee talkies, New Release, Blockbuster, Hit Films, Ranangan, Ranaangan Marathi movie, Swwapnil Joshi, Swapnil Joshi, Sachin Pilgaonkar, Siddharth Chandekar, Pranali Ghogare, Suchitra Bandekar, Aanand Ingale, Mukta Barve, Sanjay Narvekar, GSEAMS, 52 Weeks, Rakesh Sarang, etc.